What kind of cat carrier is best? Whether it’s a trip to the vet or a move to a new home, every now and then we need to pack our little furry friends into a carrier to ensure their safe passage from point A to point B. There are many kinds of cat carries available, and depending on what you need them for, there are many choices for the job. For both cats traveling in the main cabin or in the cargo hold, you’ll need a carrier that is large enough for your kitty to be able to stand up, turn around, and lie down without touching any sides of the carrier. Soft-sided carriers can provide a little more comfort for your cat while in transit and are easier to fit under the seats where they must be stowed during the flight. Many soft-sided carriers come with extra zipper compartments for treats and travel documents. If you need to travel with your cat in the cargo hold, you’ll have to select a carrier that is made of rigid plastic, metal, or wood. The door to the kennel should be made of a welded or cast metal, and the kennel itself needs to be constructed with bolts or screws. Since fitting your cat under the seat in front of you will not be an issue, you can have a carrier that’s a little bigger for added comfort during the flight. Depending on if you have a domestic, international, or extended flight, the guidelines are a little different, so be sure to check in with your airline. How your cat behaves for car trips should influence your purchasing decision. Many soft sided carriers come with extra straps that you can thread a seat belt through, and would be less harsh surface if your kitty bumps against the sides of a carrier during a sudden stop. 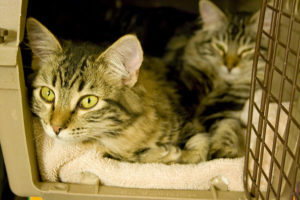 However, skittish cats can easily soil the carrier, which are hard to clean. A nervous kitty may also claw at or chew the mesh of the carrier, damaging it beyond usefulness. Hard sided carriers can offer more security then, as they are easier to clean and harder to damage. If they do not come with a location to attach a seatbelt, you can place the carrier one of the passenger footwells to keep it from moving. If you have a nervous cat, try not to get a larger carrier than necessary because smaller spaces help kitties to feel more secure and in control. In the case of an emergency where evacuation is required, it’s best to have a carrier that is lightweight and easy to take with you, or one that is easy to roll on wheels. If your cat is fairly small, backpack carriers may be a good option for you. Try to opt for a carrier that opens both on the top and on the side, which can be easier to use if your cat is panicking. A carrier that has extra compartments can be useful for preparing a cat evacuation kit, which can include food, medications, and documentation in case you find yourself away from home for a long time. You should leave the carrier in an easy to access area like at the foot of your closet. It’s also good idea to leave your carrier out in the open while you’re out of town. That way, it’s easy to access and your cat will be acclimated to its presence, which can make it easier to stow your kitty in an urgent situation. Be sure to show your pet sitter where the carrier is, too, because we like to be prepared for anything and everything. Photo by Rob Marquardt on Flickr. Does your cat have dandruff?